Know about the star of the investment industry, the Equity Funds!!! Mutual funds are in the limelight of the investment industry these days because of the many great benefits they provide. The industry is recording new heights in the number of investors, and sizes of the asset management companies are enlarging enormously in terms of Assets Under Management (AUM). If you look more into the facts, then you will know that the equities have played a major role in attracting the capital from the investors in large proportion which further helped in pushing up the overall assets size of the fund houses in India. Now that we have discussed the recent growth of the mutual fund industry, let’s move on to some of the reasons which made the investors to jump more aggressively into the equities. From the image as shown above, you must have got an idea that what exactly we want to convey about equity mutual funds. You will get higher diversification, higher returns, and higher flexibility when you will invest in the best equity mutual funds. Higher Diversification: The equity funds invest in the stocks and shares of the various companies which have the capability to provide healthy returns and growth to the invested capital in the long run. The money which you invest in the equity funds gets deployed in the various categories of stocks in different sectors. Thus, the risk of failure gets automatically reduced. Now suppose, you directly invest in the shares of any specific sector. The downturn in that sector will lead to negative returns on your investments and also you will need an extremely high analysis to determine the probability of returns in a particular sector so that you can earn good returns by investing in it. But, when you invest in equity funds, it automatically diversifies your capital in the best possible manner so that the risk of losing from the uncertain failure of any specific sector or stock does not affect your total investment much. Higher Returns: Equity is the king of the entire investment world. It is because of its well-known rewarding nature. Although it carries high risk, it also reverts unbelievable returns to the investors in the long run. There are many categories which you may encounter while stepping into the investment world, and the equity is the best as it has the potential to generate a corpus for you in return. If you see the past performances of the various best equity funds, there are many which have provided multiplied benefits in terms of returns in the long-term period. Thus, when you want to chase bigger dreams, equity is the best solution. 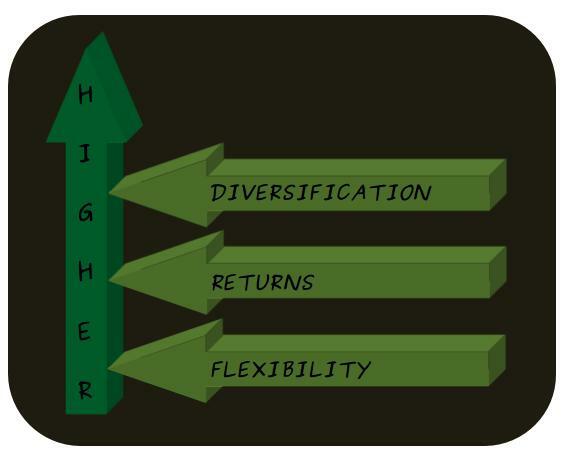 Higher Flexibility: Equity funds are highly flexible as they allow you to redeem your investment at any point in time as and when needed (Equity Linked Savings Scheme has a lock-in period of three years). It means you can easily get your money back at the time you need them. Suppose you have invested in any equity scheme (except ELSS) one year back with an aim to stay invested for ten years. But, now you have an urgent requirement of money, and you want to redeem the investment. You can easily withdraw the same at a Net Asset Value (NAV) higher than the NAV at the time of purchase. Moreover, you can also switch your investment to another scheme if the fund is not performing as per your requirements. So, don’t you want to gain the benefits of investing in equity mutual funds as mentioned above? Check out the best scheme which suits your investment objectives well and start reaping higher returns by investing in it. We, at MySIPonline, also have the expert recommended best mutual funds that would suit your interest. So, get started right away and reap the benefits of starting early through SIP!